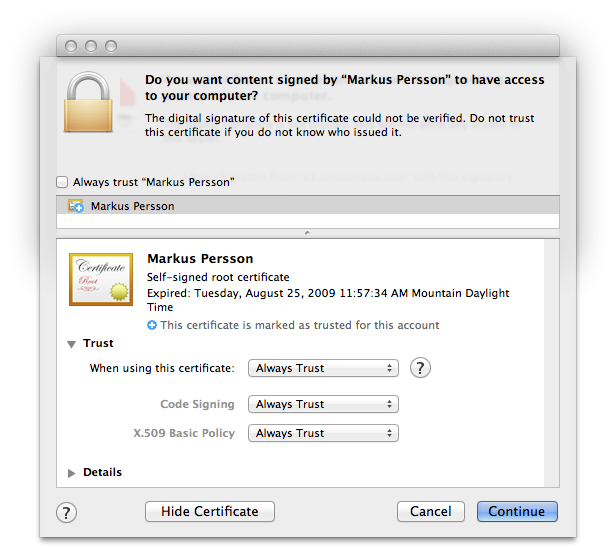 If I tick the box that says "Always trust 'Markus Persson'", and change "When using this certificate: " from "System Default," it still doesn't do anything. How can I run it in Chrome? Go into System preferences -> Security and Privacy and check the box that allows applications to be downloaded from anywhere (click the lock to make changes to this). If it doesn't help, you can try as follows: Make sure that you don't any other windows apart this certificate, maybe it's asking for you permission in the separate window. Try as well clearing your java cache and security settings. You may also need to reinstall the locally installed Minecraft files which you can find in your home directory. On Windows: %AppData% (Windows+R keys, type in %AppData% at the run command and press Enter). On Mac: ~/Library/Application Support/minecraft (your local home user directory). There will be a minecraft directory, so try to delete everything except for the saves directory that you see therein. Then, try running Minecraft again. I'd advise you to make the backup of those files before. If you don't have any Minecraft data stored, then remove the whole minecraft directory. 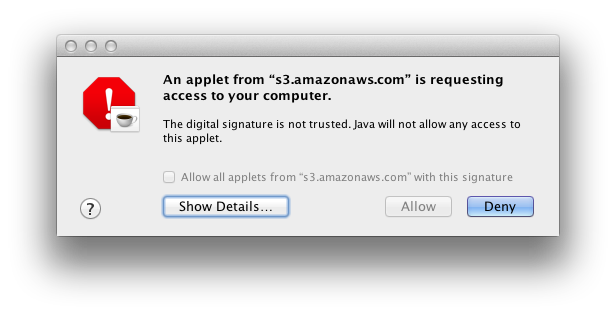 In Java Preferences, you may need to select "Allow user to grant permissions to signed content" on the advanced tab. Not the answer you're looking for? Browse other questions tagged macos google-chrome java java-applet or ask your own question. What plugin is Google Chrome blocking? Why don't I have a “Make Google Chrome the default browser” button in my Chrome settings? How to run Google Chrome as two unique Google Chrome?